The neck is the connection between head and torso. It contains several organs and pathways and is stabilized by muscles, which form the main part of the neck. As a section of the spine, the cervical vertebrae allow movement of the head and thus expand the radius of action for our perception. The cranial (to the head) and caudal (to the feet) boundaries of the neck can be identified using palpable bony protuberances. 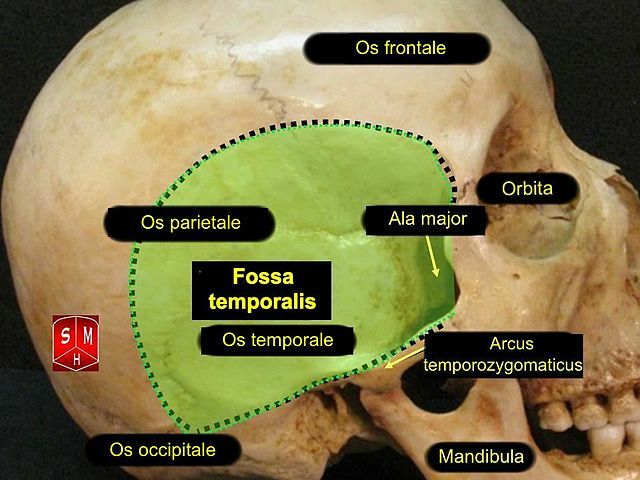 The cranial border consists of an imaginary line between the mandible ventrally and the mastoid processes and the external occipital protuberance dorsally. Caudally, the neck is bordered by bony structures of the shoulder girdle and the sternum. The clavicle and the manubrium sterni are the ventral border of the neck area, while the acromion and the posterior spinous process of the vertebra prominens (C7) form the dorsal border. The laryngeal prominence of the thyroid cartilage, the anterior cartilagineous plate of the larynx, can easily be palpated and is commonly referred to as the Adam’s apple. Above it, the os hyoideum (hyoid bone), can be palpated during the act of swallowing. Picture: “Movements of the Body, Part 1” by philschatz. License: CC BY 4.0. Changes have been made: The movements of a) , b) , d) and e) were removed . Today, the subject of “fasciae” has become a fashionable trend among fitness fans and sport scientists. Hardened fasciae are often claimed to be the cause of joint pain. This boom of the fitness-fasciae-business produced a cadre of courses dealing with various methods of stabilization of structures related to the connective tissue. In the neck, the cervical fascia is divided into three layers, each at a different depth. These layers stabilize the structures and organs that run or lie in the respective segment. In the fitness scene, this area is rather considered “unprofitable”. Thus, it is mostly disregarded – a good reason to catch up on it now. Fasciae are networks of connective tissue which surround the whole body as a continuous tension structure that ensures structural integrity. The superficial lamina originates from the mandible, the clavicle, and the manubrium sterni. Caudally, it fuses with the pectoral fascia and with the nuchal fascia (neck fascia) dorsally. It is the most superficial of the three sheets, covering all the structures of the neck and is a component of the general body fascia. The superficial arteries and veins of the skin branch on its surface. The pretracheal lamina (middle sheet) lies under the superficial fascia and originates from the hyoid bone, the manubrium sterni and the clavicles. It expands from cranial to caudal. Topographically, it is situated – like its name suggests – in front of the trachea, it covers the omohyoid muscles and fuses with the carotid sheath. The pretracheal lamina covers the following structures: Larynx, trachea, thyroid gland, pharynx, esophagus, infrahyal muscles, and the carotid sheath, which contains the common and internal carotid artery, internal jugular vein, and the vagal nerve. The prevertebral lamina (deep sheet) expands from the base of the skull to the level of the third thoracic vertebra and thus lies directly in front of the spine. It covers the deep neck muscles, the sympathetic trunk with the three cervical ganglia (superior, middle, and inferior cervical ganglion), the brachial plexus, the subclavian artery, and the phrenic nerve. The platysma, the most superficial muscle in the neck, lies on top of the superficial lamina. It provides tension in the skin between the face and chest and is responsible for opening of the jaw muscles (by pulling down the mandible). Anatomists love to classify the body in topographic spaces. The individual regions are frequently named after their topographic location or for the structures running through them – this also aids in the understanding of the anatomy of the lower face and upper neck. The lower face and upper (cervical) neck are subdivided into the superficial and deep regions. The strongest of the chewing muscles is the temporalis muscle. A skeletal muscle which originates from the temporal surface at the lateral aspect of the skull and inserts at the coronoid process of the mandible with a strong tendon. Its function is to close the jaw. It is innervated by the deep temporal nerves out of the mandibular nerve (V3 of the trigeminal nerve). The “ear-temple-nerve” originates from the V3 of the trigeminal nerve and loops around the middle meningeal artery and gives parasympathetic fibers to the parotid gland. This nerve splits into a superior ramus cranially and an inferior ramus. The two branches reunite after giving the inferior branch gives off somatosecretory fibers to the parotid gland. After that, the auriculotemporal nerve contains only sensory fibers, which innervate the temple skin, the outer ear, the external acoustic meatus, and the outside of the eardrum and the jaw joint. This nerve as it courses posteriorly to the condylar head, can be injured when performing surgery of the temporomandibular joint (TMJ), causing an ipsilateral paresthesia of the auricle and skin surrounding the ear. It is the main nerve that supplies the TMJ, along with branches of the masseteric nerve and the deep temporal. As one of the two final branches of the external carotid artery (the other one is the maxillary artery), it is accompanied by the auriculotemporal nerve. These arteries originate from the maxillary artery and split into an anterior and a posterior part. Both parts anastomose with the superficial temporal artery and supply the temporal muscle. The posterior maxillary artery anastomoses with the lacrimal artery. This region roughly corresponds to the whole cheek. Topographically, it is located under the zygomatic ramus (zygomatic arch) and the infraorbital region. The buccinator muscle originates from the outer surface of the molar processes of the upper and lower jaw and interweaves with the orbicular oris muscle. It is situated in the area of the buccal fat pad and is innervated by the buccal rami of the facial nerve (VII cranial nerve). During muscle traction, the cheeks are pulled together, which makes food move back and forth between the teeth rows. The buccinator muscle also maintains the tone of the upper and lower lip while whistling or playing a wind instrument. In infancy, it plays an important role in sucking motions of the infant’s mouth at the breast. Anteriorly, the skin of the cheek is innervated by the buccal nerve and by the zygomatic nerve posteriorly, both branches of the facial nerve. The borders of this region are a popular subject on oral exams. Knowledge of the topographic location is thus necessary. Located medially to the zygomatic arch and caudally to the temporal fossa, this region is limited by the maxillary tuber ventrally and by the articular tubercle of the temporal bone and the spine of the sphenoid bone dorsally. The greater wings of the sphenoid bone form the cranial anatomical border, the lateral lamina of the pterygoid process the medial one, and the zygomatic arch and the mandibular ramus the lateral one. The medial pterygoid muscle originates from the pterygoid fossa and inserts at the pterygoid tuberculum. The innervation occurs via the medial pterygoid nerve of the mandibular nerve. The jaw closes during simultaneous contractions. A unilateral contraction causes protrusion for crushing of food. The lateral pterygoid muscle is the only jaw opener of all chewing muscles. With the masseter muscle, it forms a muscle loop, which can raise more chewing power than the temporal muscle. Furthermore, the muscle consists of two heads. The upper head inserts at the greater wing of the sphenoid bone, the lower head at the lateral lamina of the condylar process of the mandible. The fibers of the upper head radiate into the articular capsule of the jaw joint and the articular disc. The lateral pterygoid nerve of the mandibular nerve (V3) innervates both heads. This articulation is a modified hinge type of synovial joint. The articular surfaces are: (1) the head or condyle of the mandible inferiorly and (2) the articular tubercle and the mandibular fossa of the squamous part of the temporal bone. An oval fibrocartilaginous articular disc divides the joint cavity into superior and inferior compartments. The disc is fused to the articular capsule surrounding the joint. The articular disc is more firmly bound to the mandible than to the temporal bone. Thus, when the head of the mandible slides anterior on the articular tubercle as the mouth is opened, the articular disc slides anteriorly against the posterior surface of the articular tubercle. Mouth opening consist of protrusion of the mandibular head (contraction of the lower head of the lateral pterigoid muscle) and ventral shifting of the disc (contraction of the upper head of the lateral pterigoid muscle). If both heads contract simultaneously, the mandible is protruded. However, in a unilateral contraction, the mandible moves to the opposite side and creates a grinding motion. As one of the two final branches of the external carotid artery the “jaw artery” supplies the soft tissue of the face. It originates from the area of the retromandibular fossa, passes the pterygopalatine fossa and runs close to the pterygopalatine ganglion. In its course, it is classified in three parts: the mandibular part, the pterygoid part, and the pterygopalatine part. In each part, the maxillary artery gives rise to new branches. In the mandibular part, the branches of the inferior alveolar artery, the accessory meningeal artery, the middle meningeal artery, the anterior tympanic artery, and the deep auricular artery can be found. In the pterygoid part, the maxillary artery branches into the masseteric artery, the pterygoid rami, the deep temporal artery, and the buccal artery. In the pterygopalatine part, it splits into the sphenopalatine artery, the descending palatine artery, the infraorbital artery, the posterior superior alveolar artery, the pharyngeal artery, and the artery of the pterygoid canal. This venous plexus is supplied by the inferior ophthalmic vein, the inferior alveolar vein, the sphenopalatine vein, the deep temporal veins, and the middle meningeal veins. Via a connecting piece, the maxillary vein, the venous plexus flows into the retromandibular vein and gains connection to the cavernous sinus. Clinical: Cavernous sinus thrombosis. The cause for this disease is a bacterial infection of the face with bacterial transmission. The parasympathetic ganglion is located underneath the oval foramen and contains motor, sympathetic, and parasympathetic fibers. However, only parasympathetic fibers are interconnected, the motor and sympathetic fibers simply run through the ganglion. This fossa is bordered and defined in its position by the following structures: the sphenoid bone lies cranially, the pyramidal process of the palatine bone is the caudal border. Anteriorly, there is the infratemporal surface of the maxilla and posteriorly, there is the greater wing of the sphenoid bone. The medial border is the perpendicular lamina of the palatine bone. The following structures can be found here: the pterygopalatine ganglion, the maxillary artery, the maxillary nerve, the beginning of the zygomatic nerve and of the infraorbital nerve. The pterygopalatine fossa communicates with surrounding structures via several fissures and foramina. Also referred to as parotid box. It is recommended to know the borders: The external acoustic meatus lies cranially, the mandibular ramus ventrally, the pharynx medially, the sternocleidomastoid muscle dorsally, and the digastric muscle and stylohyoideus muscle caudally. The parotid gland, which is one of the three major salivary glands. Via the retromandibular vein and the nerve network of the facial nerve, it is divided into a superficial and a deep part. The superficial part (outer lobe) touches the zygomatic arch and crosses the anterior margin of the masseter muscle. The lateral expansion reaches the mandible. The lower part (inner lobe) is significantly bulkier and completely fills the retromandibular fossa. The retromandibular vein merges the maxillary and the superficial temporal veins and flows into the internal jugular vein. The parotid plexus, which is the splitting of the facial nerve into its branches for the innervation of the mimic muscles. The parotid duct, the excretory duct of the parotid gland, leads to an opening on the opposite side of the second molar teeth. The external carotid artery splits into its two final branches: the maxillary and the superficial temporal arteries. Clinical: Parotitis epidemica. An inflammation of the parotid gland, as it occurs in the disease mumps, causes an increase in pressure in the retromandibular fossa, which leads to severe nerve irritation and pain. This triangular shaped region is located in the anterior cervical region. The cranial border is formed by the anterior margin of the mandible, the lateral, by the anterior belly of the digastric muscle, the caudal one by the hyoid bone while mylohyoid muscle forms the floor. Structures worth mentioning are the lymph nodes. Those being the submental lymphatic nodes out of the tip of the tongue, the lower incisors, and the medial lower lip. Cancer arising from the anterior third of the tongue tend to metastasize to these nodes. This paired triangular region is also located in the anterior cervical region, lateral to the submental triangle and is bordered by the following structures: Cranially, the inferior border of the mandible; the anterior belly of the digastric muscle lies ventrally, the posterior belly of the digastric muscle and the stylohyoideus muscle form the dorsal border, and the hyoid bone the caudal one. The submandibular triangles are divided into superficial, middle, and deep parts. The platsyma, the facial vein, and the marginal mandibular ramus of the facial nerve belong to the superficial part. The submandibular gland fills the middle part. In the deep region, there are the facial artery, the mylohoid nerve, the submandibular ganglion, the submandibular duct, the lingual artery, the hypoglossal nerve, the mylohyoid muscle, and the hyoglossus muscle. Cranially, the carotid triangle is limited by the posterior belly of the digastric muscle. The anterior margin of the sternocleidomastoideus muscle forms the dorsal border, and the omohyoid muscle the ventral one. The superior root of the cervical ansa is associated with the hypoglossal nerve and innervates the thyrohyoid muscle and the geniohyoid muscle. Anterior and unpaired, it’s located between the superior belly of the omohyoid, lower anterior margin of the sternocleidomastoid and the median line of the neck. Medially contains infra hyoid muscles, all depressors of the larynx and hyoid bone. Covers visceral structures of the neck including the thyroid gland, larynx, trachea and esophagus. Superior Boundary: inferior belly of Omohyoid m.
Floor: Splenius Capitus m, Levator Scapulae m, Scalenus Medius m, and a small portion of the Scalenus Anterior m.
Roof: superficial layer of Deep Investing Fascia. Contents: Trunks of the brachial plexus. Subclavian artery and external jugular vein. Floor: Splenius Capitus m, Levator Scapulae m, Scalenus Medius, and a portion of Scalenus Anterior. Spinal Accessory nerve (XI) – crosses the upper half of the triangle diagonally and, passing from the deep surface of sternocleidomastoid inferiorly on levator scapulae to reach the deep surface of trapezius, innervates sternocleidomastoid and trapezius. Lesser Occipital (C2) – follows posterior border of SCM to innervate the scalp behind and above the ear. Transverse Cervical Cutaneous Nerve of the neck (C2,3) – crosses SCM superficially and, is cutaneous for the skin of the front and side of the neck (anterior triangle). Supraclavicular Nerves (C3,4) – divides into medial, intermediate, and lateral branches, which supply sensation over the shoulder (from the sternoclavicular joint to the acromion process), lateral neck and anterior upper thoracic wall. Part of the occipital and parts of the transverse cervical and suprascapular arteries are also found in the occipital triangle. The human spine consists of 22-24 vertebrae, which are organized in five sections: cervical, thoracic, and lumbar spine, sacrum, and coccyx. In the sagittal section, four curvatures can be seen, which form a double-sigmoid shape. Curvatures to the dorsal direction are referred to as kyphosis, curvatures to the ventral direction as lordosis. Note: The cervical and lumbar spine are lordotic in nature. 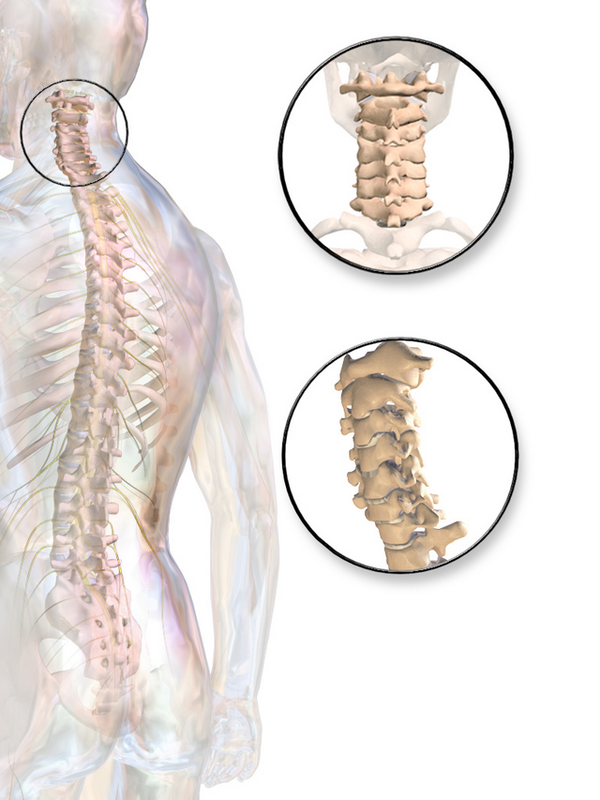 Generally, each vertebra consists of a vertebral body, a vertebral arch, and the processes of the vertebral arch. Their function is to distribute the weight of the upper body parts to the pelvic ring. Corresponding with increasing weight, the vertebrae become larger from cranial to caudal. In mammals, the cervical spine consists of seven vertebrae – yes, even in a giraffe! Morphologically, the first two vertebrae of the cervical spine (atlas and axis) and the last four to five vertebrae of the coccyx differ from the rest of the vertebrae. The transverse foramen, specific to the cervical vertebra, (also known as foramen transversarium) is an opening on each of the transverse processes which gives passage to the vertebral artery and vein and a sympathetic nerve plexus. It only exists in the cervical spine. With the occipital bone, there are six joints (two at the upper head joint, four at the lower head joint). They form a functional unit, which allows great degrees of motion of the head in all three spatial dimensions. Next to the foramen magnum, the occipital bone has two convex, downward facing joint surfaces. 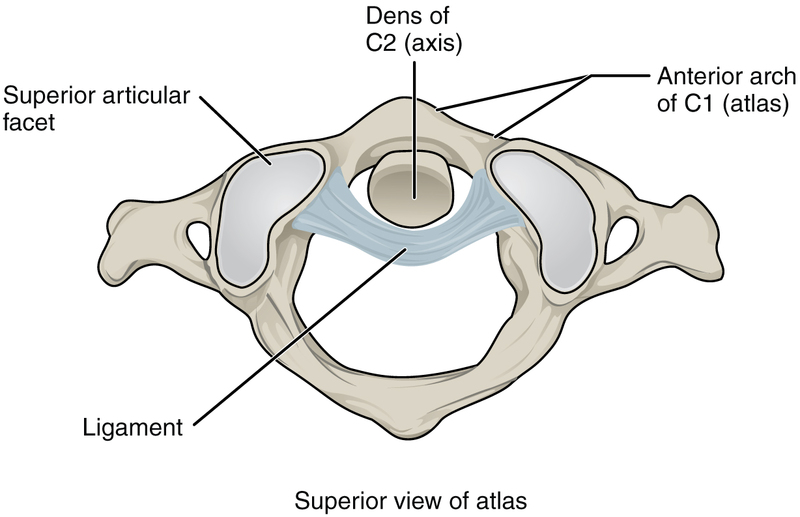 The first cervical vertebra (atlas, C1) does not have a spinous process and no vertebral body. Unique to the second cervical vertebra (axis, C2) is the odontoid process (dens axis) on the vertebral body, which has two articular surfaces (posterior and anterior articular surface). Structurally, its morphology is the same as all vertebrae. The seventh cervical vertebra has the longest and easily palpable spinous process and is thus referred to as vertebra prominens. In the occipital area there are two true joints, the atlanto-occipital joint and the atlanto-axial joint. Intervertebral Discs are absent between the three parts of the joints (axis, atlas, and occiput). The two condyles of the occiput articulate with the superior articular surface of the atlas in the atlanto-occipital joint. The atlas is connected to the occipital bone at two positions. The atlanto-occipital joint allows ventral and dorsal (30° altogether) nodding motions and tilting of the head to the side (10-15°). This joint has two degrees of motion: Thus, the head can “say yes” and is called ellipsoid- or “yes-joint”. The atlanto-axial joint consists of four individual joints. Together, they are referred to as a pivot joint and allow rotation of the atlas around the longitudinal axis of the dens axis (45°). This bi-joint consists of the median atlanto-axial joint and the lateral atlanto-axial joint. The rotation of the atlas around the process of the axis makes the person ‘say no’ (‘no-joint’). 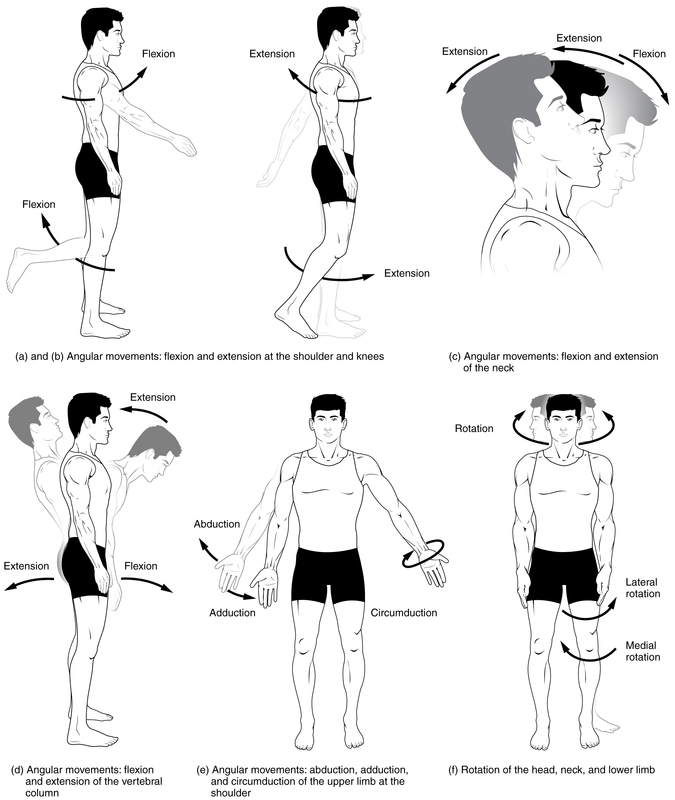 Palpation: First and foremost exam, simple palpation and light touch is the first tool to assess impairments concerning the muscles or the connective tissue. X-ray diagnostic: With this imaging procedure, the bone and joint anatomy can be visualized in terms of structure, shape, and alignment. MRI: With magnetic resonance imaging, the spinal cord and osteo-ligamentary lesions can be seen. CT: Computer tomography allows a detailed imaging of bone lesions, via computer-based analysis, consisting of several x-ray images at different angles which are combined to form sectional views. The pharynx allows us to transport respiratory air, solid food, and fluids from the mouth to their respective destinations. It connects to the posterior part of the oral cavity (as a connection to the digestive tract) and to the nose (as a connection to the respiratory system). It is a muscular tube, which is lined with mucosa. The pharynx forms a juncture at the base of the skull. The lower part connects to the larynx and with the esophagus. Within the pharynx, there are the pathways for air and food, which are separated from each other at the lower end by the epiglottis. The walls of the pharyngeal tube consist of striated muscles. The inner layer, the mucosa, keeps the surface moist. 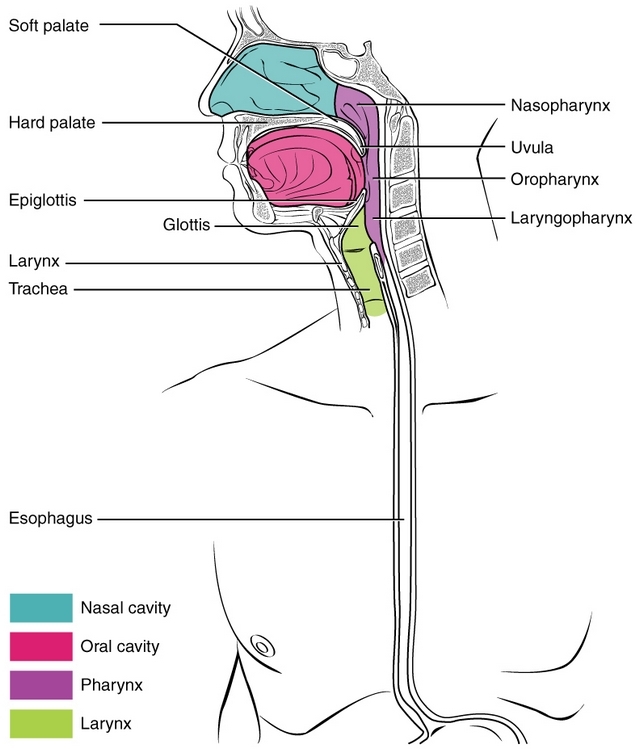 The nasopharynx is located in the upper area of the pharynx and does not belong to the neck. The oropharynx is part of the airways. Yet, this is where a part of the swallowing process occurs. The intake of solid food and fluid takes place here. In the oropharynx, there are the paired palatine tonsils. These are like the unpaired pharyngeal tonsil, part of the lymphatic system (Waldeyer’s tonsillar ring) and serves as immune defense. The laryngopharynx represents the lower part of the pharynx. It between the hyoid bone and the larynx , as well as the beginning of the esophagus. Here, the actual act of swallowing takes place. The larynx allows phonation. As well as the ability to separate the airways from the esophagus. The larynx consists of a tube-shaped cartilage frame. It gains its stability by the connection between the cartilage and muscles and ligaments. The largest cartilage in the larynx is the thyroid cartilage, which gives the whole larynx the shape of a triangle. The epiglottis lies on the upper margin of the thyroid cartilage. The epiglottis has a crucial function in the swallowing process: It can close the larynx so that food components cannot access the airways. 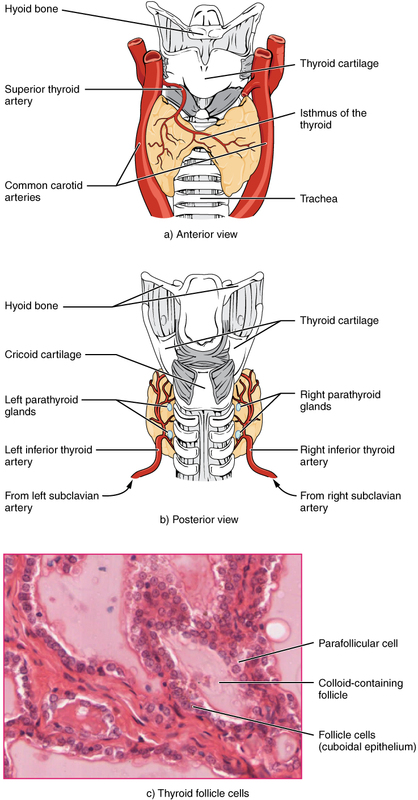 Below the thyroid cartilage is the cricoid cartilage, the base for the paired arytenoid cartilages. They are responsible for the positioning and tension of the vocal cords (vocal ligament) allowing phonation. Except for the epiglottis and the vocal cords, the whole larynx has a mucosa, which moistens the respiratory air and cleans it of small dust particles. 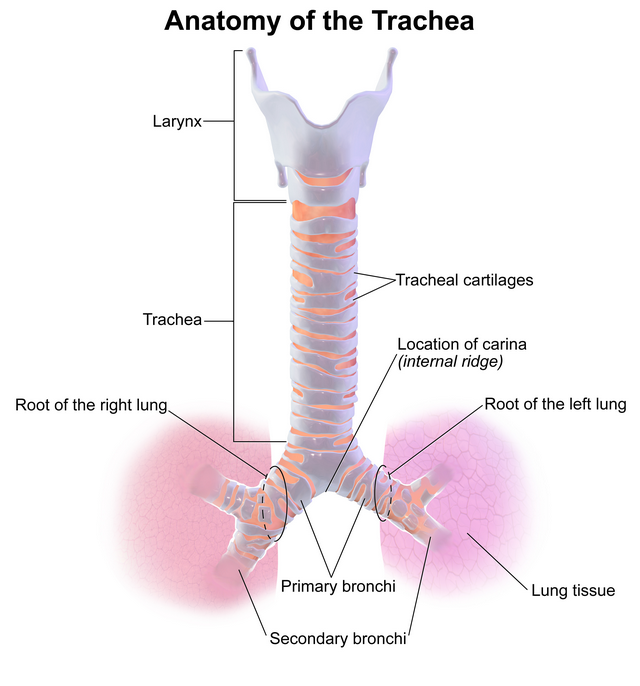 The trachea is an 11cm long connecting tube between the larynx and the bronchial system of the lung. It is stabilized by semicircular hyaline cartilage rings, inferior to the fully circled cricoid cartilage and are connected with each other via elastic connective tissue. The inner lining consists of respiratory epithelium (ciliated epithelium and goblet cells). The goblet cells allow for lubrication via secretion of mucous slime. Cilia keep tiny foreign bodies away and transport them back to the mouth or nose. The wall of the trachea touches the esophagus dorsally. The roughly 25 cm long muscular tube connects the pharynx to the stomach and transports solid and fluid food. It begins at the level of the sixth cervical vertebra. Thus, the course in the area of the neck is rather short. Topographically, the esophagus is situated between the trachea ventrally and the spine dorsally. The directed transport is reinforced by peristalsis (proper motion) of the muscular tube. Histologically, the esophagus consists of several layers and its lumen is covered with mucosa. Situated below the larynx, this organ weighs about 20 grams and has the shape of a butterfly. The two lateral lobes lie left and right of the paired thyroid cartilage of the larynx. They are connected with each other via a bridge of connective tissue, the isthmus. The follicles of the gland are organized in lobules. The main function of the thyroid gland is the production of the iodine containing thyroid hormones thyroxine (T4) and triiodothyronine (T3) and the peptide hormone calcitonin. On the posterior side of both lobes is the parathyroid gland, four small nodules which produce parathyroid hormone. This hormone is involved in calcium and phosphate metabolism. According to publications of the German Cancer Society on the platform Onko online portal, different types of cancer are can be included in the term “head and neck tumors”, as they can develop in any part of the head and neck. For example, they can develop in the oral cavity (carcinoma of the oral cavity), in the pharynx (pharyngeal carcinoma), in the larynx (laryngeal carcinoma), in the nose, the paranasal sinuses, and the outer neck areas, especially in the thyroid gland. These tumors mostly begin their malignant degeneration in the superficial cell layers (squamous cell carcinoma). Less often, adenocacinomas develop from the gland-bearing tissue and sarcomas from soft tissue. Information from the Robert-Koch Institute state that laryngeal cancer is the most frequent form of cancer in the head and neck area. Every year, 3,600 men and 500 women develop the disease. The average age of onset is 68 years. It is estimated that, all in all, roughly 50 per 100,000 people develop cancer of the head and neck in Germany every year. In contrast, about 180 per 100,000 people (women and men combined) develop colon or rectal cancer. Breast cancer, the most frequent type of cancer in women, has an incidence of roughly 136 per 100,000 people. The incidence of prostate cancer is 145 per 100,000 people. The development of malignant tumors is influenced by several factors like smoking, regular consumption of alcohol, exposure to hazardous substances (e.g. asbestos, paints rich in chrome or nickel), and viral infections (e.g. human papilloma virus, HIV). Chronic mucosal ulcers, UV- and radioactive radiation, bad mouth hygiene, and a weakened immune system also may contribute to the development of Head and Neck Cancer. Preliminary stages of cancer, so-called precancerous lesions, form the basis of malignant tumors. Leukoplakia – also referred to as “white calluses disease” – is one of these precancerous lesions. Leukoplakia mainly occurs in the mucosae of the oral cavity, the pharynx, or the larynx. Superficially, there are white areas, which cannot be wiped away and are caused by a pathological thickening of the outer layers of the mucosa. Over time, they transform into malignancies. Often, these white spots are not larger than pinheads, but they should be spotted early by an ENT specialist or dentist.